The Hayward Municipal Band will play for the annual Memorial Day program at Lone Tree Cemetery in the Hayward hills. Memorial Day is Monday, May 31, 2010. The band begins playing in the amphitheater at 10:15 a.m., followed by the customary patriotic Memorial Day program. 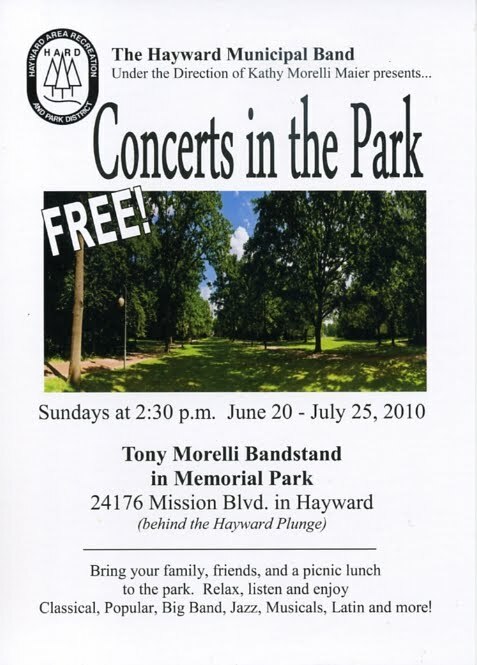 Hayward Municipal Band's 2010 season of Concerts in the Park begins June 20 and runs through July 25. 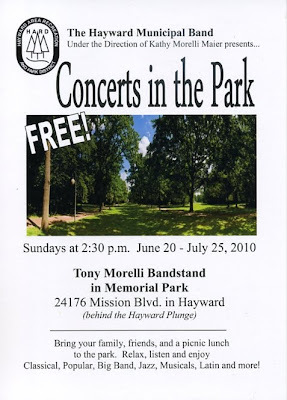 Join the band every Sunday at 2:30 p.m. at the Tony Morelli Bandstand in Hayward's beautiful Memorial Park for an enjoyable, free, family-friendly concert of classical, popular, big band, jazz, musicals, Latin music, and more.